Anesthesiologist, University Hospital Münster, Germany. Keeping the lung open is a key strategy to prevent postoperative pulmonary complications (PPCs)1,2. PPCs represent the major cause of death after both cardiothoracic and non-cardiothoracic surgery and thus pose a significant social and financial burden to society3,4,5,6. The incidence of PPCs after general surgeries lies between 5-10%7,8,9, while it has been reported to be as high as 30-40% after abdominal and intrathoracic surgery7,8,10, and for instance even 87% after liver transplantation11. Of note, a large multicenter study has revealed that up to one in every five patients who develops a severe PPC dies within 30 days of surgery, and patients who survive often suffer from a sustained reduction in functional status7. Several studies have been conducted to define reliable risk factors for the development of PPCs. The recently published LAS VEGAS risk score was the first to include intra-operative events, next to pre-operative or procedure related factors, into the analysis9. Intra-operative desaturation has shown to be significantly associated with the development of PPCs, which could reflect the occurrence of atelectasis during ventilation resulting in the decrease of functional residual capacity. These findings reveal the impact of ventilation-related factors during surgery on patient outcome and underline the need for ventilation strategies that prevent collapse of the small airways. Evone’s FCV mode provides more efficient ventilation as compared to conventional VCV protocols. A continuous inspiratory and expiratory flow without notable pauses, which are present with conventional ventilation at the end of inspiration and expiration. 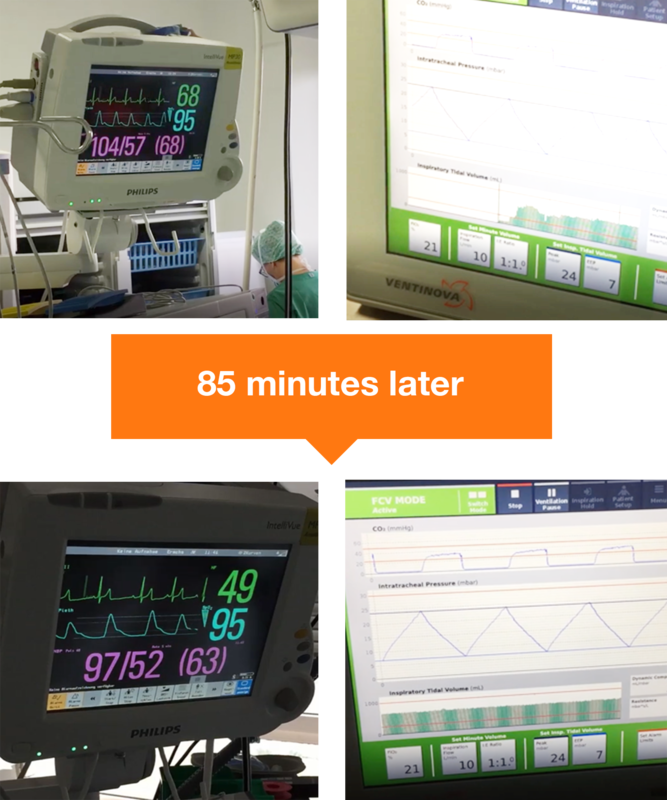 FCV ventilation aims for linear increase or decrease in intratracheal pressure during inspiration or expiration, respectively, without sudden pressure changes as compared to conventional methods. This causes the bronchioles and alveoli to be kept more open during ventilation, enhancing oxygen uptake into the blood as well as release of CO2.